(Phys.org) —How is this for bragging rights in the always-on title grab for the world's fastest supercomputer: China's Tianhe-2 supercomputer, aka Milkyway-2, recently measured at speeds of 31 petaflops (30.65) out of a theoretical peak of 49.19. The kicker is that it was not even running at full capacity. The fastest result was only using 90 percent of the machine. The stats come from a five-hour Linpack test using 14,336 nodes and 50 GB of memory of each node. (The Linpack benchmark is a measure of a computer's floating-point rate of execution. It is determined by running a computer program that solves a system of linear equations.) The numbers were revealed by University of Tennessee professor Jack Dongarra, who introduced the Linpack benchmarks, and who helps compile the biannual Top500 list of the world's most powerful supercomputers. "On May 28-29, 2013," he wrote in his report on his visit to China, "I had the opportunity to attend an International HPC Forum (IHPCF) in Changsha China, which was organized by the National University of Defense Technology (NUDT)." Regarding the test, Linpack Benchmark Run (HPL), he was sent "results showing a run of HPL benchmark using 14,336 nodes"; using "50 GB of the memory of each node and achieved 30.65 Pflop/s out of a theoretical peak of 49.19 Pflop/s or an efficiency of 62.3 percent of theoretical peak performance taking a little over five hours to complete." He said the fastest result used only 90 percent of the machine. 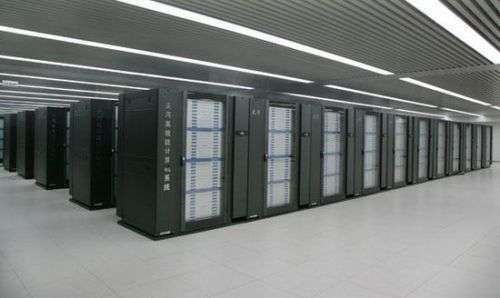 The test results place the Tianhe-2 ahead of the world's current title holder, which is the Cray XK7 system-based Titan at the Oak Ridge National Laboratory in the US. Does that mean China will nudge Titan off the top of the Top500 list? Time will tell. Interested watchers await June 17, when the latest rankings will be issued as part of the twice-yearly Top500 list. As the official record, that list is updated twice a year with the next list due out on the 17th. The Dongarra report on the Tianhe-2 talked about its hardware and software stack. As for Intel features, the computer is built with Ivy Bridge and Xeon Phi processors—32,000 Intel Ivy Bridge Xeon sockets and 48,000 Xeon Phi boards. The computer has about twice as much memory as the Titan system, and its own custom interconnect network. Dongarra in describing the interconnect said that the "TH Express-2 uses a fat tree topology with 13 switches each of 576 ports at the top level." He called it an optoelectronics hybrid transport technology. As for operating system, the Tianhe-2 is using Kylin Linux. Kylin is compatible with other operating systems and supports multiple microprocessors. He also listed "Fortran, C, C++, and Java compilers, OpenMP, and MPI 3.0 based on MPICH version 3.0.4 with custom GLEX (Galaxy Express) Channel support." Dongarra said that the Tianhe-2 is being tested at China's NUDT, where it was developed by the NUDT together with the IT company, Inspur. The latter is involved both in server manufacturing and software development. Tianhe-1, an earlier supercomputer, enjoyed the Number One title back in November 2010, at the time pushing Cray's Jaguar down to second place. In explaining the Linpack benchmark, introduced by Dongarra, theTop500 project team note that they decided on that benchmark because it is widely used and performance numbers are available for almost all relevant systems. No matter what the architecture, any supercomputer can make it into the TOP500 list just as long as it can solve a set of linear equations using floating point arithmetic. They also point out that the TOP500 rank only reflects a system's ability to solve a linear set of equations, and it does not tell anything about its performance with respect to other applications.